• DESCRIPTION: "The Fin from Outer Space" - Prepare yourself for a showdown of epic proportions. 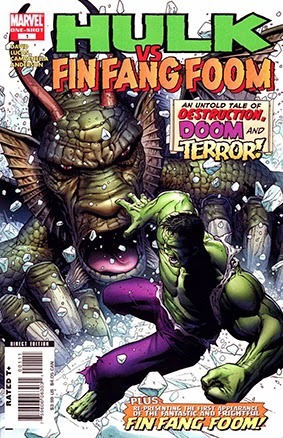 The gamma irradiated goliath, the Hulk, faces off against the mighty Marvel monster, Fin Fang Foom. This action-packed double-sized one-shot will take two of Marvel's BIGGEST... GREENEST monsters, and pit them against one-another. And you can be sure that when these big brutal beasts collide, ain't nobody gonna be happy. So place you're bets folks, cause this one's going to make it into the last rounds... My money is on the FOOM! Plus, classic slugfests from the past! Written by PETER DAVID. Penciled by TBA. Cover by JIM CHEUNG.